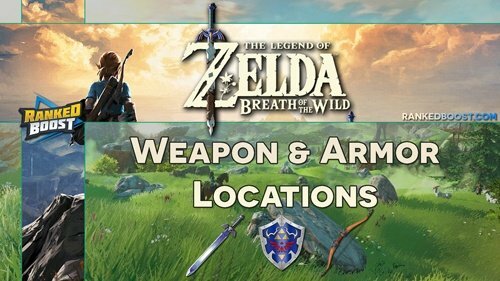 Welcome to our Legend of Zelda Breath of the Wild Weapons and Armor Location List, below we have listed every item found within the game along with its Stats and Locations it can be found. This is a list of Equipment this includes all Equipment types such as Rare Swords, Spears, Bows Shield and even Clothing Armor. Most of these items can either be Enhanced or Strengthened at some point during the game via Crafting Materials. As for Elemental Swords, Spears and Axes each has its own unique attributes. Flame/HEAT – Burning an enemy with a Flame Weapon will cause them to Panic and Flee in terror. Cold Resistance while Wielding a Flame Weapon. Thunder/ELECTRO – Shocking an enemy with an Electric Weapon will Stun them and cause the enemy to Drop Their Weapon. Frost/COLD – Freezing an enemy with a Frost Weapon will Freeze the enemy and guarantee 3X Damage Bonus while they are Frozen. Heat Resistance while Wielding a Frost Weapon. As Weapon Durability Lowers so will the Damage of the Sword. You Can View The Full Guide Here: How To Get The master Sword In Zelda Breath of the Wild. Complete the “Master of the Wind Shrine Quest” within the Shai Yota Shrine. (Can Be Forged At the Blacksmith In Zora Domain When it Breaks) Zora’s Domain under the West bridge, under the water. Attack Power: The base attack power of the bow when you shoot an arrow can be empowered. If the arrow you are using has its own power or if the bow has a power bonus it is added to the total value. Range: This indicates the distance that your arrows can travel when shot. Multiple Arrows: Certain Bows In Breath of the Wild can shoot Multiple Arrows at the Cost of Only 1 Arrow. Quick Shot: Certain bows have this bonus, enabling them to shot arrows in a fast rapid succession. (Range 20) Zora River North of Lanayru Tower. 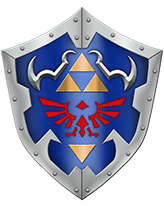 Zelda Breath of the Wild Shields can block damage from enemy weapons, but they also have another function “Shield Surfing”. Link can use certain shields as a snowboard at the cost of the shield integrity AKA durability only when ridden on coarse terrain, snowboarding on snowy terrain will NOT damage the shield. Parry Power: The attack power of your shield with the parry command (ZL + A). This is only a measurement of offensive power through the Shield Parry not to be confused with Perfect Guard. Some Zelda Breath of the Wild Armor Clothing can reduce elemental damage done to link, while other armor such as Metal Armor can increase your chance to be struck by lightning in a thunderstorm. Flame Guard: Prevents Damage from Lava-induced extreme temperatures. Heat Resistance: Prevents damage from hot temperatures. Cold Resistance: Prevents damage from freezing temperatures. Shock Resistance: Prevents electric damage. Guardian Resistance: Reduces damage received from Guardians. Night Speed Up: Increase Movement Speed During Night Time. Attack Up: Increase Weapon Attack Damage by 20%-LVL 1 • 30%-LVL 2 • 50%-LVL 3. Ancient Proficiency: Increase Damage inflicted with weapons of the Ancient Guardian Type. Defense Up: Increases Your Defense by 4-LVL 1 • 12-LVL 2 • 24-LVL 3. Sand Travel: Maintian normal movement speed on sand. Snow Travel: Maintain normal movement speed on deep snow. FireProof: Makes you Immune to the Burnt Effect. UnFreezable: Makes you Immune to the Frozen Effect. UnShockable: Makes you Immune to the Shock Effect. Lighting Proof: Makes you Immune Lighting. Armor Set Bonus: When you upgrade the three pieces of a set to level 2 ☆, you will gain special effect wearing the full set. Upgrade: This is the cost to Upgrade your Armor from Level ☆ to the next Level ☆☆, To upgrade your Armor you will need to locate all 4 of the Great Fairy Fountains to reach Level ☆☆☆☆ Armor. (Armor Set Bonus: Swim Dash Stamina Up.) North East of Zora’s Domain at Toto Lake. There are some ruins under the water. Use Magnesis to scan under the surface and raise the chest. Old Shirt 1 Chest: Shrine of Ressurection. Kara Kara Bazaar The Gerudo Villa on top of the Tower. (Faster Climb Speed) Complete Shrine Quest “Secret of the Cedars“. (Sand Travel) Side Quest “The Eighth Heroine“. (Snow Travel) Side Quest “The Forgotten Sword“. (Armor Set Bonus: Heat Resistance.) Kara Kara Bazaar The Gerudo Villa on top of the Tower. (Armor Set Bonus: Master Sword Beam Up.) Side Quest: A gift from the Monks.